Tiger Funding is an online business funding company founded in 2014. It has funded more than 15,000 small and medium sized businesses spread across more than 500 industries. The company utilizes technology and data to give customers a seamless, fully digital funding experience that is personalized to them. Tiger helps business owners pick the best funding option and compare offers side by side. The “all online” process makes it a fast and convenient way for businesses to get the money they need. As a Business Owner, you only need to complete a simple 3 minute online application to get firm offers for funding. 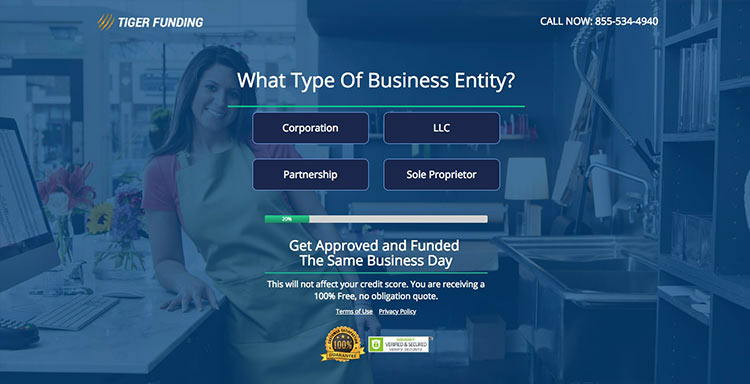 Applicants can chose from offers for working capital loans, equipment financing, SBA loans, business lines of credit or Merchant Cash Advances (MCAs). Tiger Funding primarily works with Business Owners who have been turned down by a bank or prefer not to take out a traditional loan due to time constraints. You may know more about loans than MCAs, which are lump sum payments in exchange for an agreed fixed cost. This type of funding is usually repayable within a shorter period. In other words, an MCA is a cash advance against future revenues. In Tiger’s case, the funding amount, cost, and repayment period are open to negotiation. The “turn” (MCA-speak for term length) is typically between 2 and 24 months, with some of their other products having a longer range. Best suited to small and medium sized businesses that have strong and stable monthly revenues, have a solid plan to boost revenues in the near future and need a cash injection of $3,000 to $1,000,000 to fund expansion. Tiger Funding serves businesses in the construction, retail, restaurant, salons and spa, automotive, manufacturing, and medical industries. Fast and flexible funding options. Tiger does not restrict how you use the money. It offers multiple products and an “all online” approach. A Merchant Cash Advance from Tiger Funding works on a fixed cost. Calculating your repayment is simple: the funding amount plus the fixed cost equals the amount you need to repay. The entire process is as simple as applying, picking the offer that meets your needs and digitally signing the contract. Tiger funds in as little as 24 hours. Only suited to companies planning revenue boost; not suited to companies that need pay off existing debt. Website only presents basic information about rates and repayment terms. To apply, fill out a short form on their website. Applicants must meet 3 criteria to be considered for business funding: at least 6 months of business operations; at least $10,000 per month in revenue; and significant potential for future business growth. Applicants won’t be asked to provide a full credit history; all Tiger will want to see is your last 3 months business bank statements. Tiger Funding reaches a decision on most applications within 24 hours and will generally make an offer if your business meets the above mentioned criteria. If your business is approved for an MCA, business loan or line of credit, Tiger will present you with all of the funding offers you qualify for and the terms. Tiger Funding doesn’t advertise specific amounts, but MCAs are typically suited to businesses needing a $3,000 to $250,000 cash injection. When applying for an MCA for your business, you will be asked to submit the advance amount you need. Tiger Funding will determine the advance amount it is willing to offer you by looking at your business’s gross monthly revenues, the length of time your business has been operating, and your business’s potential for growth. When assessing your application, Tiger Funding will also determine your fixed rate, or Factor Rate, based on the information you provide in your application. It will also determine a Turn, referring to the number of days for repayment. Depending on the advance amount and fixed cost, the Turn can typically be 60-260 days. Where bank loans usually require fixed monthly payments, Tiger will take daily micropayments from your business account on business days, based on the percent of sales you purchased. In months where revenues are lower than expected, Tiger will take smaller daily repayments, and in months where revenues are higher than expected, it will take higher repayments. With that said, Tiger promises never to change your daily repayment amount without consulting you. Customer support staff can be reached by phone during business hours. It will also contact you if you fill out an online form. It takes 3 minutes to fill out the form, and requires only a small amount of information to get started. 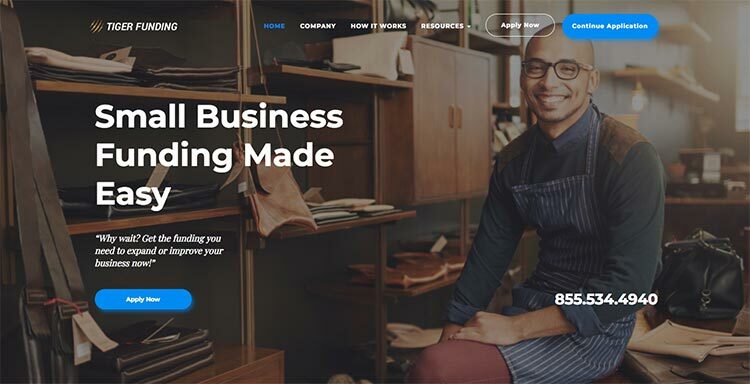 Tiger Funding is a useful lending option for small businesses that don’t want the hassle of filling out lots of paperwork or waiting more than a couple of days for funding, and it's other loan options are broad, with lines of credit, and small business loans. Although you won’t know your factor rate and repayment terms until the end of the application process, Tiger is very upfront about what is required: put simply, if your business has been operating for 6 months and meets the minimum revenue requirements of $10,000 per month, you shouldn’t have too much trouble securing an MCA or other type of business loan.